This is I think the GetOption method applied to the relevant SessionConfiguration object. The question is what string do I identify the terminal emulation file field with? What do I put instead of "??????" You will need to specify the name of the session.ini option that you are trying to get/set in the string field. This is label 1 in the screenshot. I want to set the parameter shown in label2 in the screenshot. Depending on the vendor (cisco, Huawei, juniper etc) I want to set a custom keyboard emulation. 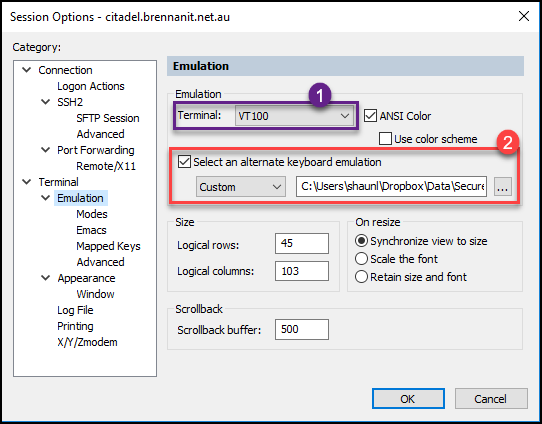 In order to achieve the desired configuration, you will need to set "Use Alternate Keyboard" to "00000001", "Keymap Name" to "Custom" and "Keymap Filename V2" to the "C:\path\to\the\keymap\file.key". All of these options are in the session.ini file. 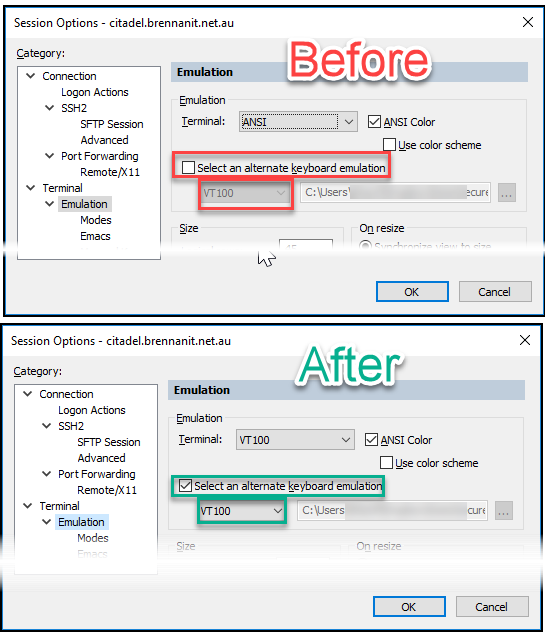 If you would like to be able to determine which option(s) to set you can do a comparison of the session.ini file before and after making the manual changes in SecureCRT. The first part which is identical to the script provided above, works fine. gives me all manner of errors. In the current form that I have it see below. Last edited by bgagnon; 04-17-2019 at 03:34 PM. The complete code below works for me.